Since the end of the Cold War, significant attention has focussed on the issue of nuclear deterrence and in particular whether formal nuclear security guarantees from nuclear weapons states to non-nuclear weapons states involving the possible use of nuclear weapons have a place in the twenty-first century global strategic landscape. Growing support for nuclear disarmament in the US and elsewhere has seen serious doubts being raised about the ongoing utility of extended nuclear deterrence. This book provides the first detailed analysis of the way in which extended nuclear deterrence operates in contemporary Asia. It addresses the following key questions: What does the role of extended nuclear deterrence in Asia tell us about the broader role of extended nuclear deterrence in the contemporary international system? Is this role likely to change significantly in the years ahead? 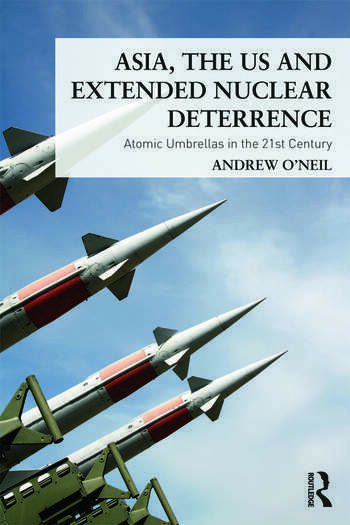 O’Neil uses a theoretical and historical framework to analyse the contemporary and future dynamics of extended nuclear deterrence in Asia and challenges many of the existing orthodox perspectives on the topic. Providing a new perspective on debates surrounding extended nuclear deterrence, this book will be of interest not only to students and scholars of Asian politics, international relations and security studies, but also to policy makers and professionals. Andrew O’Neil is the Director of the Griffith Asia Institute and a Professor in the School of Government and International Relations at Griffith University. Before entering academia in 2000, he was a strategic analyst with Australia’s Intelligence Community. He is the author of Nuclear Proliferation in Northeast Asia: The Quest for Security (Palgrave Macmillan, 2007).